Anyone in the world can become an inspiration in their own way throughout their life. Teachers are some of the most underappreciated individuals in the world. More often than not, their contributions to society are overlooked, and their impact upon the minds of the youth is understated. As long as one’s own existence seem amazing to another person, then he or she is considered inspirational in the person’s eyes. One of the most inspirational figures often in everyone’s life is a teacher. As educators, they can influence the minds of their students, and their words can have a lasting impression on their perceptions. One cannot help but send their appreciation to their teachers who inspired them to do better in life and in this article, we will show you a way to show your appreciation. The best way to convey your appreciation, or rather the most professional way is by writing an Appreciation Letter. The objective of writing this letter is to express your gratitude towards your teacher who has taken extra effort in helping you with your studies. 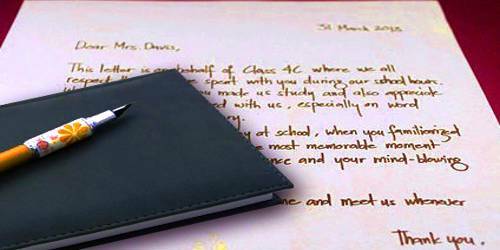 Writing a brief letter of appreciation can be a great way for you to express your gratitude and make your teacher feel special. Teachers have an essential role to play in the lives of their students. They take pains in moulding the lives of their students in a positive direction, putting their personal needs aside. The least one can do, to show their appreciation is by writing a letter conveying their thanks for all the help the teacher has given them. First and foremost, it is vital to write the letter sincerely and genuinely. You must mention in your letter how your teacher’s contribution has brought about a change in your perspective. While the tone of the letter must be formal, it should have a personal touch. The wording of the letter must be such that the reader should feel appreciated for his/her efforts. I am writing this letter to express my appreciation towards your efforts in clearing our doubts at the (mention occasion) at the (Venue) on (date). (Describe in your own words). The way you explained the intricacies of the subject with clarity deserves applause. You have made the subject more interesting by giving us a deeper, and clearer insight about its implications and I’m sure that many students will want to follow your footsteps after that lecture. (Cordially describe your greetings). I, once again, would like to thank you for your efforts in clearing our doubts and I assure you that we will work as per your instructions and prove ourselves.